Silver catalysis has emerged as a powerful tool in the field of organic synthesis. 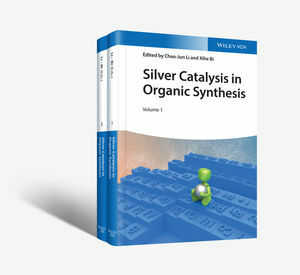 This comprehensive book systematically explores the unique performance of silver catalysis, introducing all the recent progress of silver catalysis in organic synthesis. It clearly emphasizes the unique features of silver catalysis and provides the reaction mechanism involved. This two-volume book also provides vivid schematics and tables throughout to enhance the accessibility to the relevant theory and mechanisms. Silver-Catalyzed Cyclizations; Silver-Mediated Radical Reactions; Silver-Mediated Fluorination, Perfluoroalkylation and Trifluoromethylthiolation Reactions; Coupling Reactions and C-H Functionalization; Silver-Catalyzed CO2 Incorporation; Silver-Catalyzed Carbene, Nitrene, and Silylene Transfer Reactions; Asymmetric Silver-Catalyzed Reactions; Silver-Catalyzed Reduction and Oxidation of Aldehydes and Their Derivatives; Silver Complexes in Organic Transformations; and Silver Nanoparticles in Organic Transformations. Silver Catalysis in Organic Synthesis will appeal to a wide readership including chemists, biochemists, pharmaceutical scientists, biomedical researchers, agriculture scientists, and graduate students in the related fields. Chao-Jun Li, PhD, is E. B. Eddy Professor and Canada Research Chair in the Department of Chemistry at McGill University, Canada. Xihe Bi, PhD, is a Professor at Northeast Normal University, China, where he and his research team focus on making innovations in organic reactions by silver catalysis.